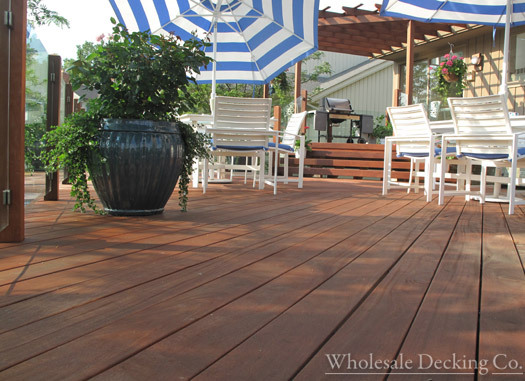 We specialize in exotic wholesale decking. Each species has its own set of unique traits and strengths. With so many successful applications, we are one of the first suppliers that contractors call prior to making a bid. When you look at the decking products we offer, it's easy to see why our customers are able to convert their bids into successfully completed applications. The king of decking hardwoods, ipe is world renowned for its herculean strength and admirable durability. Impervious to the ravaging jaws of termites, and as resistant to the consuming flame as concrete or steel, our wholesale ipe decking can easily stand up to the harshest of elements. It features a pleasing reddish-brown color that will fade to silver unless treated with UV protection. Ipe is by far our most requested deck material. It's ideal for outdoor decks and boardwalk applications. Capable of handling all weather conditions, our premium grade Ipe decking is special because, years from now, it will look and perform just as well as when it was first installed. 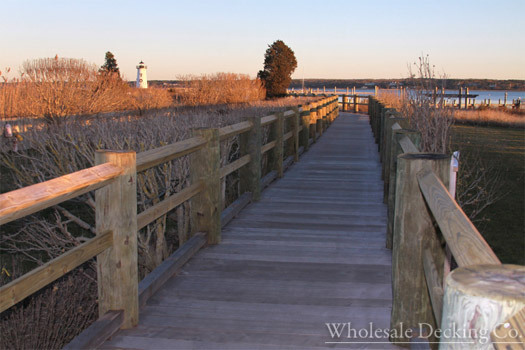 Our Premium grade Ipe Decking was chosen for this Martha's Vineyard Lighthouse renovation project. Proof of this is found in the boardwalks of Atlantic City and Coney Island. For decades, these high-traffic coastal applications thrived because of the dependable nature of ipe decking. Imagine for a second, how much business would be disrupted if every 3-5 years or so a boardwalk or restaurant deck had to undergo extensive and costly maintenance. Unfortunately, that's the predicament many city planners are facing after they installed composite decking. Mold, decay, and accidents are just some of the reasons why composites are NOT the ideal material for such high-traffic and economically important areas. See some pictures of our most successful decking projects. The second strongest hardwood we sell, cumaru is our second most popular hardwood for large scale commercial projects. It also has the added benefit of being nearly as strong as ipe without the higher price. Cumaru has a slightly more interesting surface than ipe, with a more varied color pallet ranging from earthy red to golden tan. Cumaru is extremely dense and naturally resistant to rot and decay. Cumaru is one of our most preferred decking product for three major reasons: attractive looks, superior durability, low price. What you need out of hardwood decking, Cumaru provides. No other natural decking material you come across will stand toe-to-toe with ipe in terms of strength and long-term benefits. Are you building a boardwalk on the California coast and need a high traffic material that won't splinter or cause major litigation headaches? Cumaru is naturally slip resistant, and won't split or check like pressure treated materials. It also will outlast even the most expensive composite materials with natural mold and decay resistance. Of course, seeing is believing. Check out some wonderful outdoor decking project pictures that prove the point. Tigerwood decking's most notable feature is its wild aesthetic. As its name implies, this hardwood displays a vibrant spectacle of black stripes dancing boldly across a vivid orange backdrop. While not as hard as ipe or cumaru, our tigerwood wholesale decking is still naturally durable, resisting insects and decay with ease. Want to make an immediate impact on your customers? Create a deck, or boardwalk with Tigerwood. Not only is it many times harder than pressure treated decking, it's also the most duplicated decking material. Simply put, composite decking companies try to mimic the bold and attractive look of Tigerwood with mixed results. As you can see, Tigerwood creates wonderful spaces customers will rave about time and again. Our Premium grade Tigerwood Decking speaks for itself. Tigerwood has the immediate impact of being the most visually stunning decking material in the market today. No other species offers such a dynamic look that is 100% natural. What could be better than that? How about durability that offers a longer lifespan that cedar, teak and bamboo decking. How about natural slip, skid and splinter resistance? Does resilience against mold and decay also interest you? How about pricing that's 30% to 40% cheaper than composite deck materials? Oh yeah, the look's not too shabby, either. See some pictures of our most successful decking projects. Garapa decking has a unique look. Like a little piece of heaven, garapa's gold and honey tones will brighten any area. Although it is the softest species we sell, do not be fooled. Like all our exotic wood species, this hardwood is naturally durable, resistant to fire, insects, and rot. Give your outdoor building project the gold treatment. Garapa decking is renowned for its golden and warm honey tones. One of our most highly requested wholesale decking materials, Garapa has been used in both tropical and high traffic areas where bare feet and slip and falls are major concerns. Garapa gives you a bold, and inviting look. It's also harder than California redwood, cedar, and will give your customers years of hassle free use. Check out our decking project pictures and see for yourself what hardwood decking at wholesale prices can accomplish. Massaranduba is immediately recognizable by its rich red color. It's often called Brazilian redwood, but massaranduba is far tougher than the North American redwood lumber. It's comparable to ipe in strength and durability. 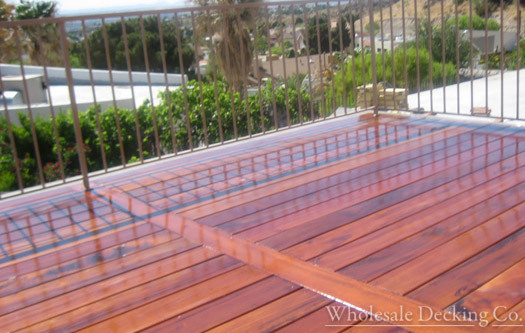 Architects, planners, and contractors prefer to work with our Wholesale decking supply service for these reasons and more. Price. We keep it low by ensuring that each order is processed right from the get go. We also work with the best mills and freight companies to ensure fast delivery. Are you ready to order? Have any questions? Contact us to buy Wholesale Decking.